[New York, NY – June 15, 2018] Today, Multi-Grammy Award winning blues icon Buddy Guy releases his brand new studio album, The Blues Is Alive And Well via Silvertone/RCA Records. In advance of album release, Buddy released a few songs for his fans: “Cognac” featuring Keith Richards & Jeff Beck, “Blue No More” featuring James Bay, and the Sonny Boy Williamson penned-classic “Nine Below Zero.” The album also features Mick Jagger joining Buddy on “You Did The Crime.” Grammy Award winning producer/songwriter and longtime collaborator Tom Hambridge produced the album and penned 13 original songs for the album. It was previously announced that Buddy Guy will be the recipient of the The Americana Music Association Lifetime Achievement Award on September 12th ceremony at Nashville’s Ryman Auditorium. 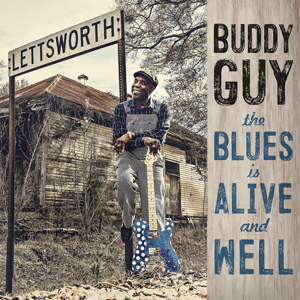 Visit http://americanamusic.org/ for more information.THE BLUES IS ALIVE AND WELL is Buddy Guy’s follow up to his 2015 album Born To Play Guitar, which won “Best Blues Album” at the 2016 Grammy Awards, debuted at #1 on Billboard’s Top Blues Album charts and marked Guy’s fifth #1 album on the chart and twelfth Top 10 Billboard Blues album.